There was a slight improvement in the future expectations index, which was up 1.0 points to 61.9. This is encouraging as consumers see the current economic problems as temporary and anticipate the economy was more likely to rise from this point than turn down in the year ahead. 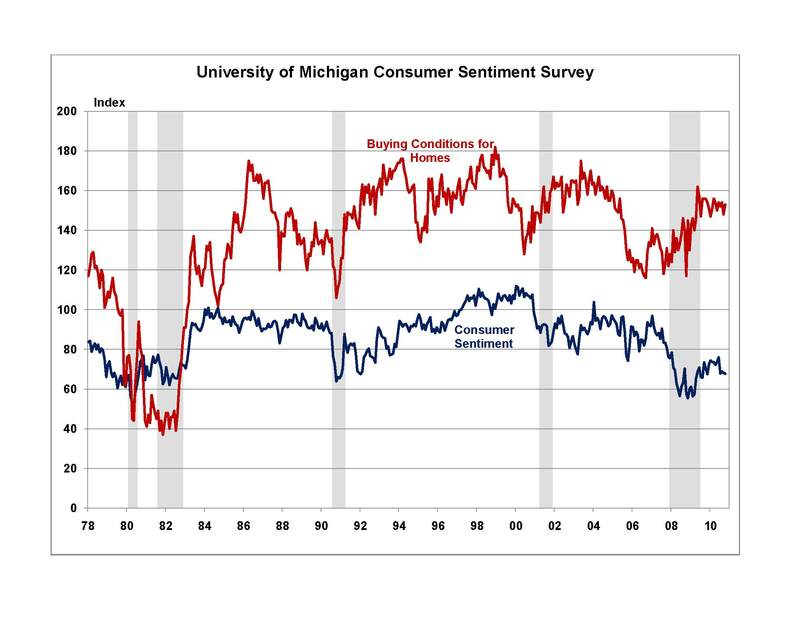 Despite this, “nearly six-in-ten consumers thought that overall conditions in the economy would still be unfavorable” in the year ahead. The index of buying conditions for homes recovered most of the ground lost the previous month, up 6 points to 153 in October. Three quarters of respondents identified that they believe home buying conditions were good, with low prices (63%) and low interest rates (41%) the main reasons. The rebound in the buying conditions index corresponds with the turnaround in housing demand with both new and existing home sales ticking up in recent months. Despite the very high level of the home buying conditions index (indicating that consumers recognize the favorable housing affordability conditions), consumers appear reluctant to enter the housing market in large numbers. Concerns about continued weakness in the United States economy and the prospect of further increases in the unemployment rate are weighing heavily on consumers decisions.